The biggest story line at the French Open is Rafa Nadal’s attempt to win his ludicrous tenth French Open title. There have been various articles and tributes lauding the possible achievement but Andre Agassi got all mushy in his attempt to do so. The eight-time Grand Slam champion Andre Agassi posted a touching letter he wrote to Rafa Nadal this week that expressed how inspriring Nadal was to Agassi. It felt a bit odd for one grown man to write another man a letter of simply expressing his admiration, and especially weird to then just post it to social media before sending it to him. 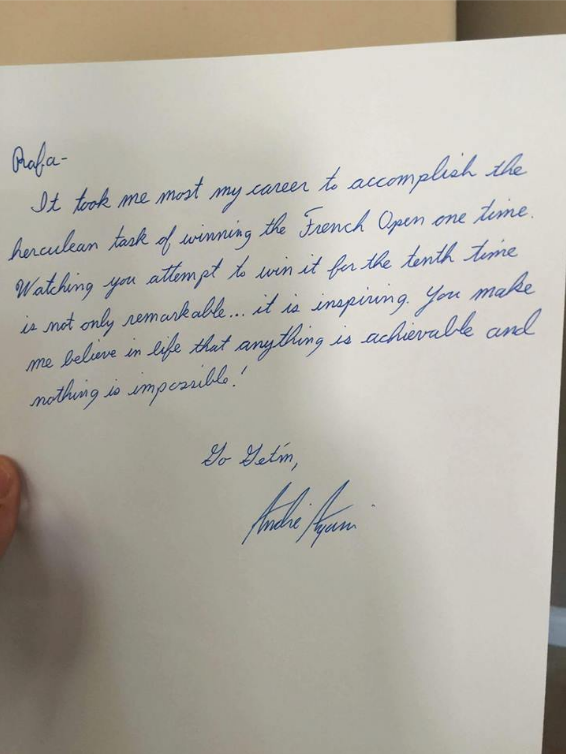 Then I found out it was simply for a Nike promotion in which fans will be posting letters to Nadal in the Nike Store in Paris. This disappoints me. I was picturing Agassi sitting in his boxers in his home in Vegas and thinking to himself, “I should write Rafa a letter”. Then goes and grabs a piece a computer paper, digs around in the junk drawer for a pen and then practices his upper case cursive “R” a few times. Then he delicately folds the note, puts some lipstick on, firmly kisses the white paper finally spraying it with Aramis Always Andre Agassi Cologne. You know, guy stuff. It’s still kind of sweet but Nike taints it a bit. Check it out below.